Maybe playing by the rules just isn't your thing. Maybe you're the type of girl who reaches for a cutlass instead of a smartphone to fight your way out of trouble. Maybe you're the type of girl who takes what she wants, when she wants...by any means necessary. Maybe you like to say phrases like, “Arrrrrghhh,” and “Shiver me timbers!” a little more than most other girls you know. Maybe, just maybe, you were meant to be a pirate! It's true. Collecting treasure maps isn't a common career path these days, but sometimes, you just have to follow your dreams. And us? Well, we're all about helping people follow their dreams. 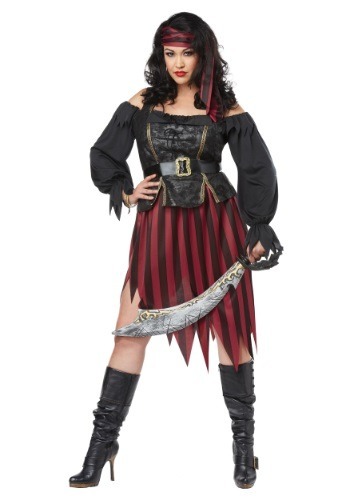 This Queen of the High Seas costume is a women's plus size pirate costume that's designed to help you get your fill of adventure, while giving you a look so stunning, you may just start a mutiny on any ship that you step foot onto. It has a beautiful black top that hearkens to a life of adventure! 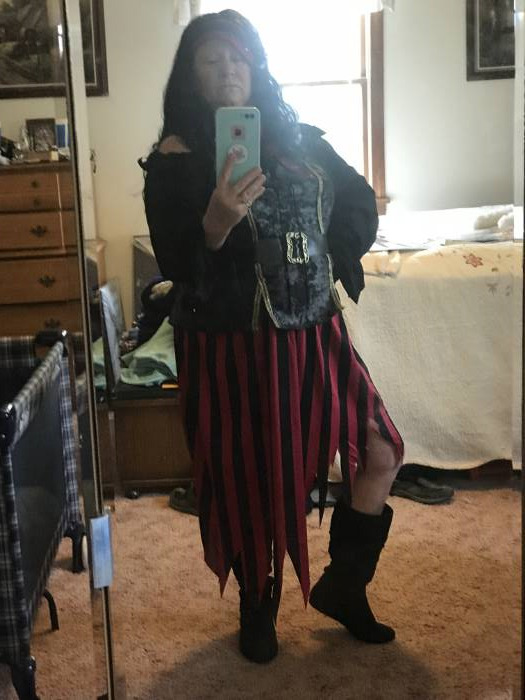 The skirt has a striped red and black pattern and a jagged cut, perfect for swashbuckling journeys across the seas, or a trip to the next costume party. All you need to do is grab a pirate sword and set sail! Just make sure to wear a pair of pirate boots from our pirate accessories section. Once you have those, you can recruit your friends and family as your crew of wily buccaneers for a treasure hunting excursion.